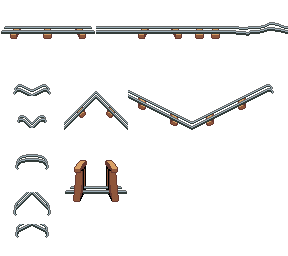 Below is my latest iteration of the cave tileset. Unfortunatly I haven't got any of the older official cave tiles to compare to. Everything is so purdy. I had already been meaning to rework the lamp as well but it looks like you beat me to it. Also, a little technical nitpick. The wood entrance supports will need to be split up into 2 tiles so that the character can walk in between the beams. Edit: please don't use the above image (If you do, insure your colours are correct). Somewhere along the line I must of messed up the colours, my bad. -Edit: Wayofthepixel.net is up and running again. 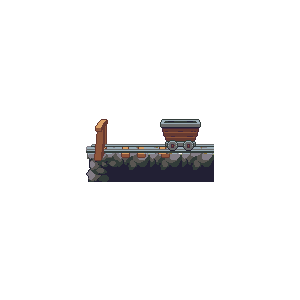 Please view the topic over there for the latest cave tilesets and assets. I also fixed the colours in an updated version of the image above, which can also be found at the wayofthepixel.net website. That thread is here, just for the record. Posting the updates over here on PJ since the WotP thread is a bit dead. More animations and recolors to come. Those mushrooms :D Just awesome and I can see jumping on them being very satisfying. Sweet. I'm a touch busy atm, but I'll add the images to the reference implementation if you draw them! What about the style? Do you think it is too shiny? I can try to remove the shinning parts to fit the OPP style. Please Feel free to criticise and modify it. Rails, historically, also run for a bit outside the mine. Although it's usually 'just down the hill a bit' to where they'd sort the ore and put it on a bigger train or something. Maybe we should make a minecart and a version of it with the main character on it. 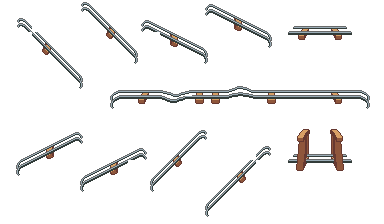 I've only just now come back to this and realized how cool these tracks are, a minecart with a character would be wonderful indeed! Yea, a minecart would be cool. I made this cart. What do you think? It might be a bit small for our characters? Perhaps it should be a bit wider? Maybe even smaller wheels to make it look less stable? Still needs work I think. I'd like to get one of the characters in there as a visual aid, to see whether or not its too small or not. So Melanke, are you going to look in to update the rails a bit as discussed in the chat yesterday, or should I have a go? Pistachio, I can't quite figure out where you meant to place the background objects. What did you have in mind? I would be able to suggest some edits to the background rocks (some tiles are missing anyway), like making sure the base edges never have any transparent parts so there are no gaps between the objects and the tiles? Also the diagonal crystals confuse me. Are the end tiles the ones which are mirrored? Where would you put them?